When and Where was Charles Barry Born? 23rd May 1795, Bridge Street, Westminster, London, England. Charles Barry was the son of Walter Edward Barry, a Stationer. Educated privately in Homerton and then at Aspley Guise. Then apprenticed to a Surveyor in Lambeth. 1810: Apprenticed to a Lambeth Surveyor. 1817: Death of Charles Barry’s father. He inherited money which allowed him to travel around Europe and the Middle East. his travels in Italy inspired him to become an architect. 1820: He returns to England. 1824: Barry won a competition to design the Royal Manchester Institution for the Promotion of Literature, Science and the Art. (Now forms part of Manchester Art gallery). 1825: He began work on Buile House in Salford and also a number of churches in the Manchester area. He realised that the Church Commisoners preferred the gothic style so matched his work to that pattern. 1826: Charles Barry designed St Peter’s Church, Brighton which is one of the first good examples of the Gothic Revival style in Britain. 1832: Designed the Traveler’s Club in Pall Mall, London using the Italianate style. 1834: The old Houses of Parliament burn down in a fire on 16th October. Parliament had sat here since 1547. The only part of the Medieval Structure to survive (which still stands today) is Westminster Hall. 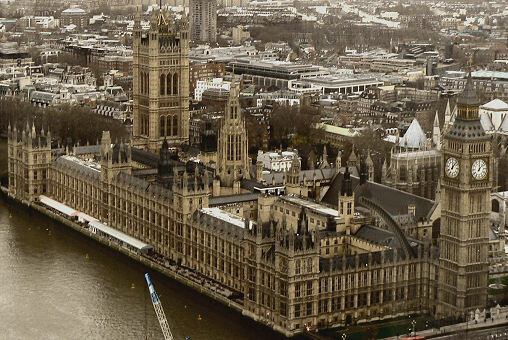 1836: Barry won the commission to rebuild the Houses of Parliament (sometimes now as the Palace of Westminster) and set to work jointly with Augustus Pugin on the designs. 1840: The foundation stone of the Houses of Parliament was laid on 27th April by Charles Barry’s wife Sarah. Elected an Associate of the Royal Academy. 1841: Barry was elected a Full Member of the Royal Academy. 1842: Charles Barry worked on Highclere Castle in Hampshire to restore and extend the Elizabethan House. 1846: He designed the Italianate Bridgewater House, London and worked on the Treasury Building in Whitehall. 1847: Completion of the House of Lords section. Also began to work on ideas for the Great Exhibition of 1851. 1849: He became a Fellow of the Royal Society. 1850: Awarded the Royal Gold Medal by the Royal Institute of British Architects. 1852: Completion of the House of Commons section. The project was late and over budget although he was knighted in this year. The Victoria Tower at the House of Lords end stands at 336 feet and was the tallest tower in the world at the time. The tower at the other end has a clock on and inside a bell known as “The Big Ben” which chimes the hours. Many people call the tower “Big Ben incorrectly. 1859: Designed Cliveden House in Buckinghamshire. 12th May 1860, at his house “The Elms”, in Clapham Common, London SW4. 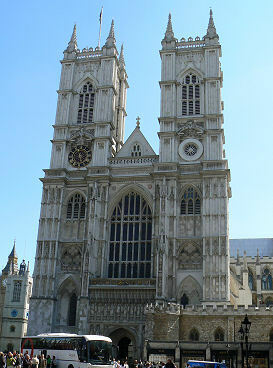 Ashes interred in Westminster Abbey, London. Blue Plaque on his house “The Elms”, in Clapham Common. The Travelers Club, 106 Pall Mall, SW1Y. Dulwich College and the Old Grammar School. Designed Manchester City Art Gallery. 1824: St. Peter’s Church, Brighton.